This entry was posted in Uncategorized on September 15, 2016 by Floyd A. Reed. 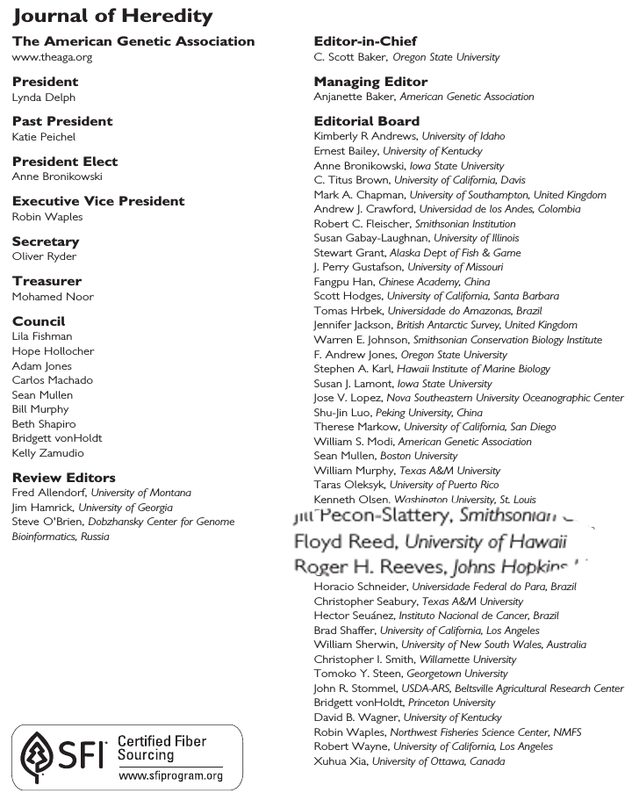 I've been asked to serve as an Associate Editor on the editorial board for the Journal of Heredity (established in 1903 with a 2015 impact factor of 2.075), to help handle manuscript submissions and reviews. I looked today and saw that I was just added to the front matter (it is a long list so I magnified it). This entry was posted in Uncategorized on September 13, 2016 by Floyd A. Reed. What is the best approach to address avian malaria in Hawai'i right now? I started this lab blog in the interest of transparency, so that the public could see what we were doing. To that end I am putting down my recent thoughts about what we should/could be doing in the near future to address avian malaria and native bird conservation. I have been to several meetings about Hawaiian forest bird conservation since I arrived in Hawai'i five years ago. I have talked to people that have been going to these same types of meetings for 25 years or longer. There is a frustration that has been communicated to me and that I am also sensing that at each meeting the urgency of doing something is discussed but that it doesn't translate into sufficient action in the field. (However, positive things have occurred such as establishing reserves, reforesting, and bringing some species into captive breeding programs, but these alone are not sufficient.) The birds have been going extinct for over a century and are continuing to be lost. In the next five to ten years, unless something changes dramatically, we will loose several additional species. At this last meeting a person (I am not sure if they want to be identified here) spoke with emotion about the po'ouli (Melamprosops phaeosoma) which was lost in 2004. Part of the problems were egos, infighting, political maneuvering, and personalities that stood in the way of action. By the time it was decided that they should be brought into captivity it was too late. I have been thinking critically about what I can do that would be most effective and most likely to succeed and to try to step back and ask, if as much ego, self interest, politics, and personalities were removed from the equation as possible, what approach suggests itself. I came here to Hawai'i with the idea of porting underdominance that we had engineered in fruit flies to (non-native introduced) Culex mosquitoes in order to transform the wild population to not pass on the parasite that causes avian malaria. I am still interested in doing this, but several things are making me question if this is the best course of action in the short term. Laven first proposed using cytoplasmic incompatibility (due to Wolbachia) to suppress wild populations in the 1960's and there have been successful applications of this. Other labs are working on using Wolbachia in insect pest management approaches in various ways. Because of this I have purposely steered clear of cytoplasmic incompatibility and tried to develop my own approach: both to create a new option that could be used and to not interfere with, crowd the field, or compete with other efforts. However, it is now five years later and no one has (in the lab) a Wolbachia based option in Hawai'i. I have been trying repeatedly to raise funding from NSF and NIH in addition to other sources to conduct our underdomiannce work (as well as develop new sterile insect techniques), and have been unsuccessful (which is extremely personally frustrating). Writing these grant applications takes time and at this point they have only wasted time. I also have been working on several scientific publications but combined with my teaching load and committee work this also slows down what I could be doing in the lab. At the end of the day underdominance is a genetic modification, which may slow down regulatory approval and inhibit public acceptance and it is (probably) more technically challenging to engineer then a Wolbachia approach. Importantly, since I am having to pay for this out of pocket, with my own personal funds, it is also (probably) much cheaper to develop a Wolbachia based approach. We have established a colony of Culex mosquitoes in the lab from local populations of Culex here in Hawai'i and have optimized our rearing technique. We have in-lab microinjection instruments and a technique optimized for Culex mosquitoes and have our injection survival rate up to 13% now. We also have Drosophila melanogaster, Drosophila simulans, and access to Hawaiian Drosophila; all as sources of various strains of Wolbachia. We can raise our Culex with tetracycline to remove their endogenous Wolbachia. Isolate Wolbachia from these other insects and inject it into our Culex. (Or just inject new Wolbachia---do we really need to clear the old Wolbachia first?) Then set up some crosses and test if the cytoplasmic incompatibility between the two types works and they do not have viable offspring. This is not a genetic modification in the sense of inserting new DNA sequences into the Culex nuclear genome, which may aide regulatory approval and public acceptance. This could all proceed very quickly; especially if I take a temporary break from writing new grant applications and publications and stop all new projects (which sounds dangerously close to career suicide but I have tenure now so I might as well use it to get something done). I could then provide the mosquitoes to other labs here in Hawai'i for additional testing (I know Carter Atkinson is already interested in this approach and I asked him if he minded if I went ahead a tried to do this; he agreed and gave me the go ahead, which is great that we are already not conflicting with each other!) and ultimately this could be an option to use either alone or in combination with other techniques: releasing males with a different type of Wolbachia to mate with wild female Culex, so that there are no offspring, to suppress the population of mosquitoes in the next generation. This entry was posted in Uncategorized on September 9, 2016 by Floyd A. Reed. There are several big news items recently, a lot of it corresponding to the IUCN conference here in Honolulu, that I need to post updates about. (And I have fallen behind in posting in general as the classes have started up this semester.) I just returned from a "mosquito meeting" on the Big Island, more about that soon. One big item in the lab is that I am going to change our lab strategy temporarily from underdominance to Wolbachia with the mosquitoes (and more about that soon). For the moment here is a link to a Washington Post article by Chelsea Harvey who called, interviewed me by phone late last week, and quoted me in the article. This entry was posted in Uncategorized on September 8, 2016 by Floyd A. Reed.